Mother Earth Brewing is a company local to this website, producing beer in Kinston, North Carolina. 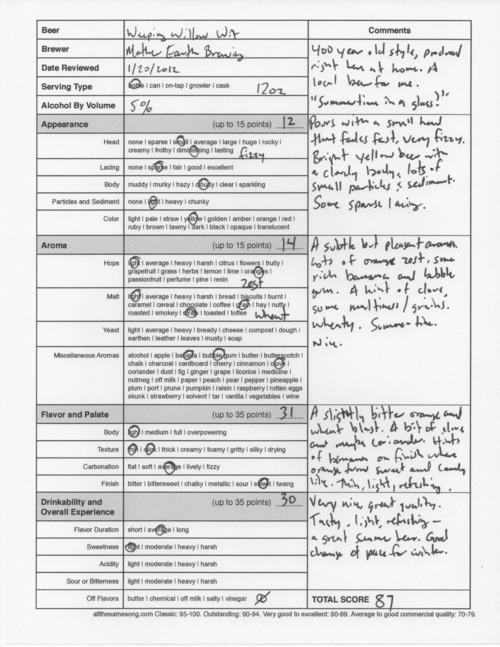 I’ve reviewed one of their beers, Dark Cloud, and was very impressed. Today, I’m looking at Weeping Willow Wit, a Belgian Wit that is meant to be enjoyed in the summer, although it is brewed year-round. Hey, sometimes in the dead of winter, you have to change the pace up and at least think about summertime. Mother Earth is a new brewery, started up in 2008 by Trent Mooring and Stephen Hill. They have a unique relationship — Trent is married to Stephen’s daughter — and both are homegrown produce nuts. Stephen brewed a beer with tomatoes he called “Red Eye,” gave a taste to Trent, and after listening to some vinyl records from the 1960’s, the idea to make some beer came out and here we are today. Follow your heart, yeah? 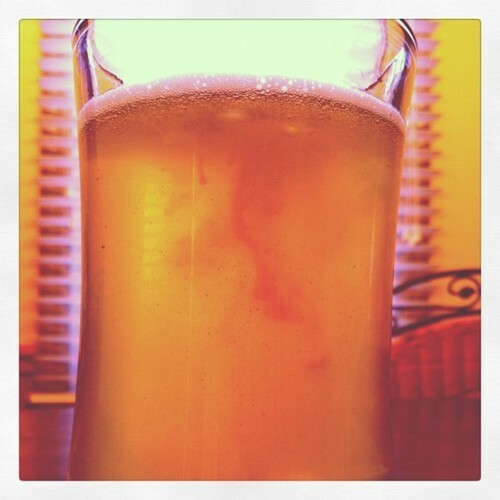 The pour made for a beer with a small head that quickly diminished, fizzy in nature. 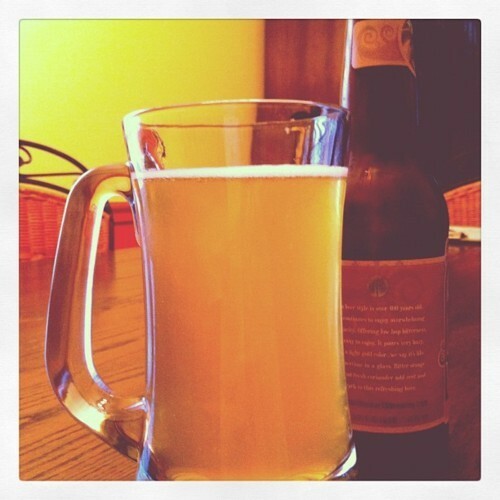 The color of the beer was a vibrant bright yellow, not pale fizzy lager yellow. I don’t think it was as cloudy as described on the bottle, but there was a cloudiness to it, along with a load of small particles and sediment distributed throughout the liquid. The lacing was sparse and not much to talk about. The aromatics were subtle but very pleasant and complex. There’s loads of orange zest up front, along with some rich banana notes, some bubble gum, and a hint of clove. The underlying scents are grainy/wheat, and the descriptor of “summertime in a glass” fits perfectly. Very nice. On the first sip, there’s a slightly bitter orange and wheat blast, met with clove and some coriander in the middle of the taste. The finish hints on the banana and the orange concludes by turning sweet, which is rounded out nicely by a candy-like pink bubble gum as the flavor fades. The texture is thin and slick, but it’s perfectly refreshing, light and impressive. Two for two! 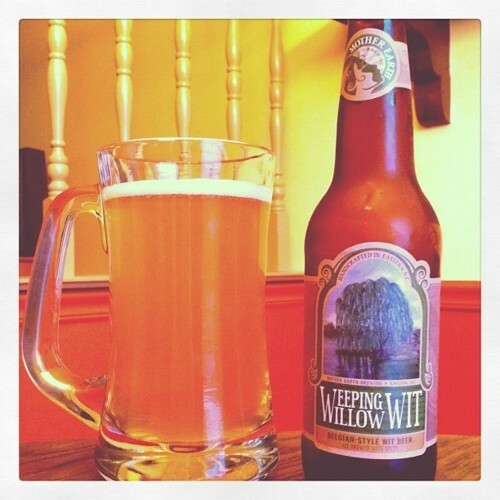 Mother Earth has another good beer here with the Weeping Willow Wit. This one is tasty and exactly what I wanted on this cloudy winter day — a change of scenery. I can’t wait to revisit this one in the summer. Other breweries might make this beer only a seasonal offering; I’m glad Weeping Willow is year-round. Mother Earth Weeping Willow Wit, 87 points. Price: $1.79 US for one twelve ounce bottle.